With pro football season leading up to Super Bowl LII on February 4, what better time than now to visit the Pro Football Hall of Fame in Canton, Ohio. Find your favorite gridiron heroes inside the football shaped rotunda, and learn interesting facts about their careers. When arriving at the Hall of Fame, you are greeted by this wall-size picture of the Class of 2017. The Hall of Fame is a tribute to those men who have made football America’s favorite sport. 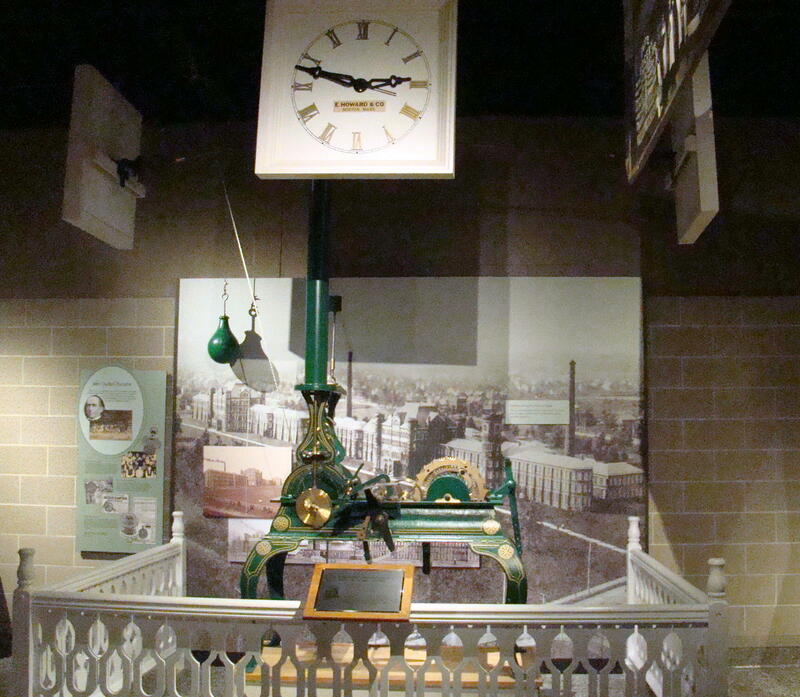 Many wonder why this Hall of Fame was located in Canton. Back in 1920 the American Professional Football Association, renamed National Football League, was founded in Canton. Professional football hit Canton before the NFL was formed when the Canton Bulldogs and Massillon Tigers played at Myers Lake Park Grounds. The Canton Bulldogs were one of the early pro football powers, even before the days of the NFL and had as their rivals the Massillon Tigers. Today, local high school teams are still called Canton Bulldogs and Massillon Tigers. And they remain rivals. The Bulldogs won the championship of the NFL in 1922 and 1923. Jim Thrope played his first pro football with the Bulldogs, starting in 1915. Ernie Nevers has the NFL’s longest standing record. Nevers was the ‘whole show’ in 1929, when he scored all 40 points for the Chicago Cardinals. Sounds like there were plenty of reasons to build the Pro Football Hall of Fame in Canton. It’s mission is to honor the heroes of the game, preserve its history, promote its values and celebrate excellence everywhere. Some call it the Sistine Chapel of Football. A statue of the legendary Jim Thorpe stands at the center of the rotunda’s football history. The circular football shaped rotunda shows progress of football from its beginning in the 1920s to 2010s. A statue of Jim Thorpe, “The Legend”, stands in the center. The walls are filled throughout with interesting football statistics. 310 bronze busts fill the Hall of Fame Gallery beginning with the Classes of 1963 and 1964. One special spot is the Hall of Fame Gallery, which features a bronze bust of each of the members of the Hall of Fame starting with that first class in 1963. As of 2017, there are 310 members in this prestigious display. Only 1% of the people who play professional football make it to the Hall of Fame Gallery. Tom Benson Hall of Fame Stadium hosts the annual Hall of Fame game as well as various high school and college football events. A holographic theater presents A Game for Life. This presentation puts you in a Locker Room, which uses a hologram of Joe Namath to teach life lessons instead of the game of football. This high tech presentation teaches the importance of character, confidence and respect through advice given by football legends. As you leave through the game tunnel, a sign says, “YOUR Game of Life begins now”. After the Game for Life presentation, this encouraging sign hangs in the game tunnel. 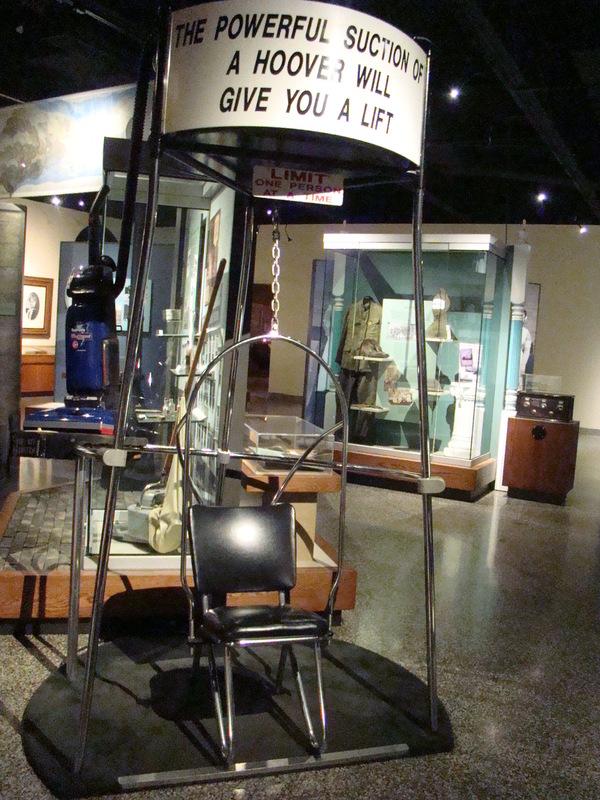 The Lamar Hunt Super Bowl Gallery is thus named because Hunt came up with the name “Super Bowl”. He also suggesting using Roman numerals to designate the years – a practice that has been maintained for 51 years. 2017 being Super Bowl LI. From that first Super Bowl ring until last years, the diamonds have increased from 1 to 283, to signify the 28-3 deficit the Patriots overcame to win the Super Bowl. In Super Bowl Theater, seating revolves to show you a progression of scenes from regular season to Super Bowl. The video shown was the 2017 game highlights between New England Patriots and Atlanta Falcons, often called the greatest comeback in the history of the Super Bowl. It was also the first overtime in Super Bowl history, which gave the Patriots an exciting victory. Johnson Controls Hall of Fame Village plans to open for the 100th NFL season in 2019. Expansion at the Hall of Fame location promises increased traffic in the Canton area. The new complex being developed at a cost of $700,000,000 is called Johnson Controls Hall of Fame Village, where everything is tied together in a network called a “smart city”. It includes a four star hotel, an inside water park and amusement center, training facilities, and a retirement center just to name a few highlights. Perhaps you’d enjoy visiting “The Most Inspiring Place on Earth”. Hundreds of thousands of fans from across the globe trek to Canton annually to visit the Pro Football Hall of Fame. It was heartwarming to see many fathers sharing stories of football heroes with their sons. If you’re a football fan, this Hall of Fame is a place you would certainly enjoy visiting. Then, get ready for the action of Super Bowl LII. “I have never been in doubt since I was old enough to think intelligently, that I would someday be made president.” These words were spoken during his youth by President William McKinley, the first president to ride in an automobile while in office as well as the first to use a telephone as part of his campaign. The resting place of William McKinley, 25th president of the United States, catches your eye driving down I-77 through Canton, Ohio. 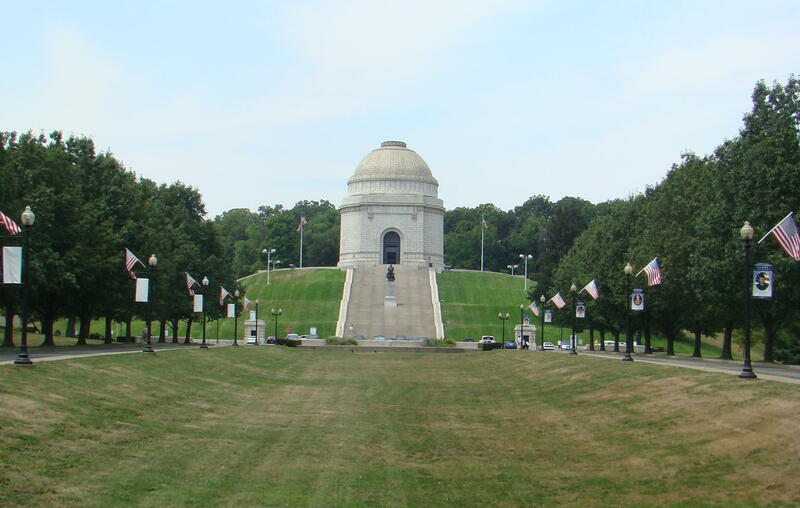 The domed mausoleum is more than a mere resting place, but serves as a a monument to Canton’s favorite son and former governor of Ohio. There are several reasons that McKinley is a favorite in this area: Canton is where he started his law career, found his true love, and ran for the highest office in the land. But while attending the 1901 Pan-American Exposition in Buffalo, New York, President McKinley was assassinated just seconds after giving the red carnation from his label to a little girl waiting in line. In 1905 construction was begun after selecting a memorial design drafted by Harold Van Buren Magonigle. This architect began his career at the age of thirteen when he worked as a draftsman for the firm that designed Central Park in New York City. The front steps seem to be a real attraction for area residents as a wonderful place for exercise, either walking or running. 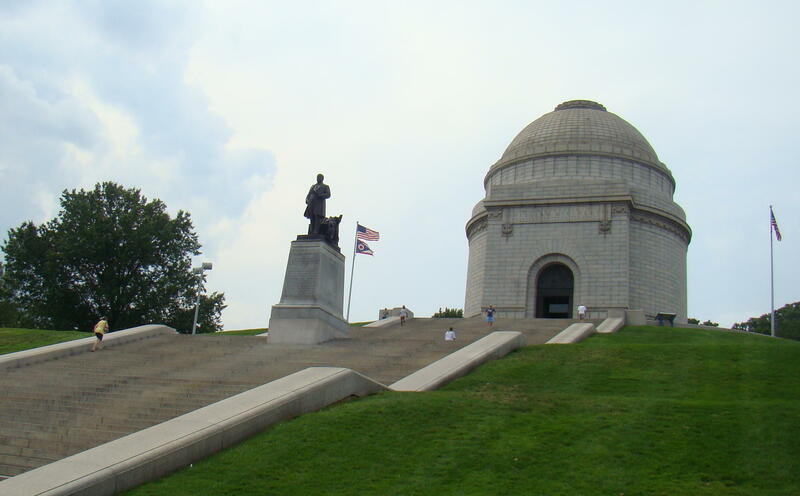 Since there are 108 steps up to the McKinley Monument, it is a challenge to young and old alike. The front steps are fifty feet wide and are broken into four flights of twenty four steps with the final flight having only twelve. Nearing the top of the stairs, visitors are greeted by a 9 1/2′ bronze statue of William McKinley created by Charles Henry Nishaus. The circular mausoleum recaptured the spirit of ancient cultures and formed the center of the cross design Magonigle intended to create. The longer arm of the cross was formed by front steps and what was called Long Water. Originally Long Water was a spectacular part of the monument with a 575-foot lagoon, consisting of five different water levels cascading downward into a reflecting pool. Unfortunately, due to stagnant water caused by poor circulation, this lagoon was filled back in the 1950’s. Both side arms of the cross were formed by shorter entry steps, and the top portion was a driveway behind the monument. Magonigle considered this shape to have a double meaning. The upper part of the cross resembled the handle of a sword, while the Long Water symbolized the blade. This seemed appropriate due to McKinley’s military career during the Civil War as well as his being commander-in-chief during the Spanish-American War. 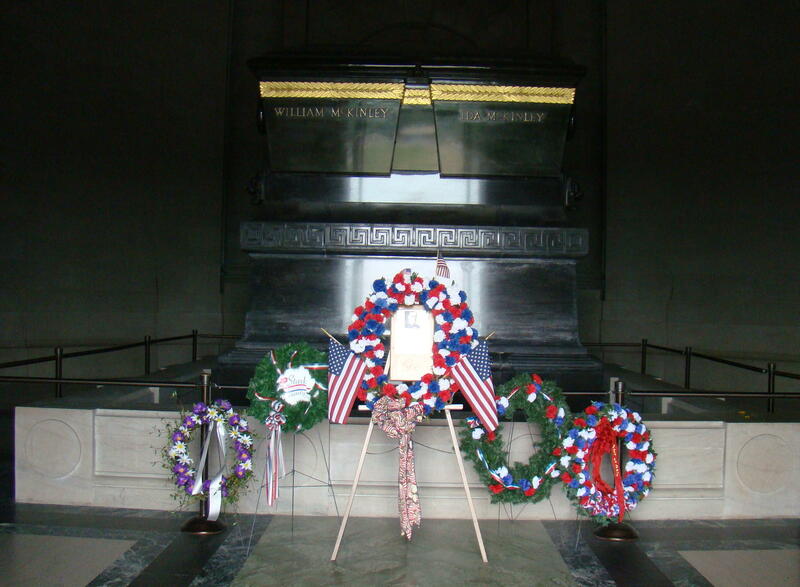 Above ground in the pink granite memorial, President McKinley and his First Lady are entombed in a double sarcophagus of elegant green granite on a dark maroon granite base. Their two daughters have found their final resting place here also, entombed in the back wall of the memorial. Wreaths are constantly being placed by individuals and organizations at the foot of the granite clad coffins. Most of the wreaths are in traditional red, white and blue. 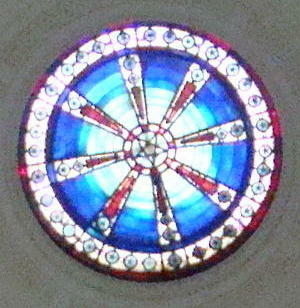 Seventy-five feet overhead is a beautiful red, white and blue skylight with a 45 star design, representing the number of states in the Union at the time of McKinley’s death. While it looks small from below, this beautiful window to the sky measures twelve feet in diameter. If you wish to visit the memorial without climbing all those stairs, there are two possibilities. A steep road leads up the hill behind the Memorial, or there is also an elevator, which operates only during museum business hours by use of a special code. 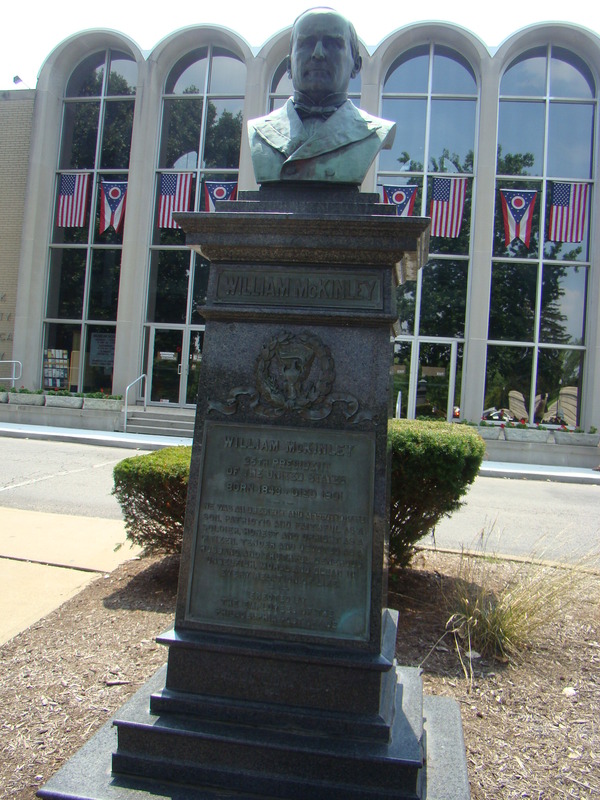 The McKinley Monument is located in downtown Canton, Ohio just off I-77. Take Exit 105 for OH 172, then turn right on 7th Street NW. 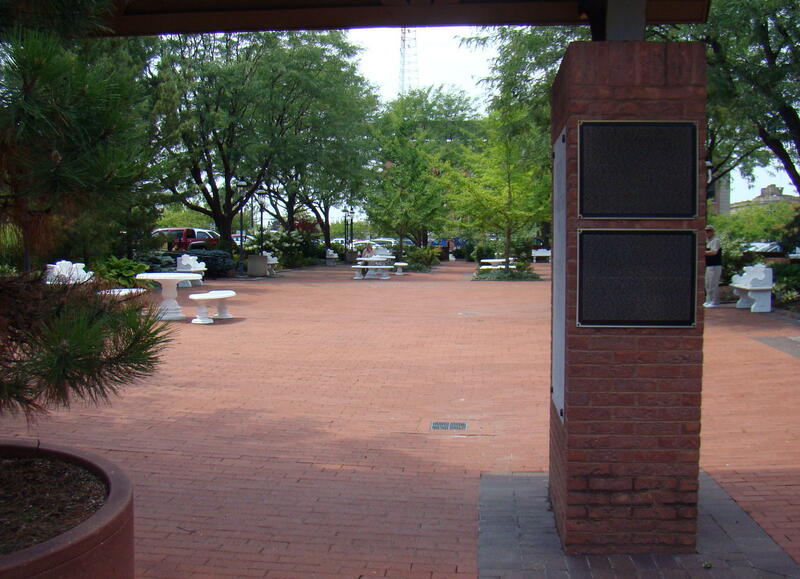 Take the first left onto McKinley Monument Drive and enjoy a little piece of history. Could the sound of footsteps on the spiral staircase at the Saxton McKinley House be those of Ida McKinley? Once in a while the footsteps echo late at night, and the light step is attributed to Ida. That seems quite possible as this was her family home where she lived for twenty-eight years. Beautiful gardens connect the Education and Research Center to the Ida Saxton McKinley House, both part of the First Ladies National Historic Site in Canton, Ohio. Visitors were greeted by a young lady dressed in a replica of Julia Tyler’s gown. She was very knowledgeable regarding the history of the house and the family. 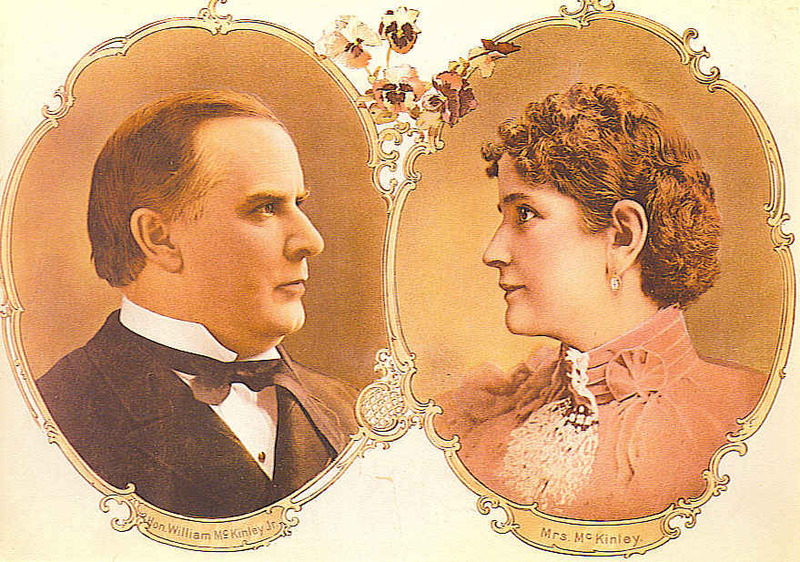 To add a little mystery, there are conflicting stories as to how Ida and William McKinley met each other. Some said Ida was a cashier in the bank where William transacted business for the law firm he joined when moving to Canton. Another story said that both Ida and William were Sunday School teachers at different churches, and passed each other on the way to church. Or perhaps they met during a picnic at Myers Lake Park. However they met, William indulged her every whim and was seldom far from her side, which turned out to be a major political asset. The Saxton McKinley House was originally built in 1840 by Ida’s maternal grandfather, George DeWalt. 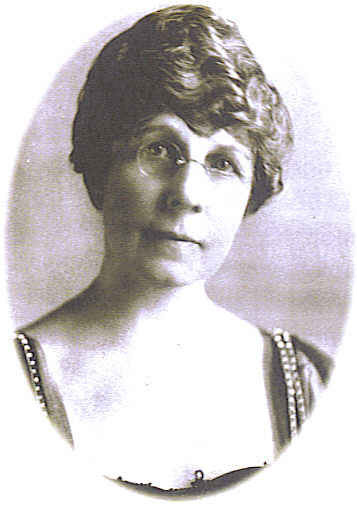 Her other grandfather, John Saxton, was founder of the Canton Repository newspaper. Her affluent background made it possible to lead an extravagant lifestyle. Almost everything inside the house today is a reproduction, but based very carefully on the Victorian style used in the original 1800’s house – after extensive research at the Smithsonian. Fortunately, there are still original walls and woodwork throughout much of the home. 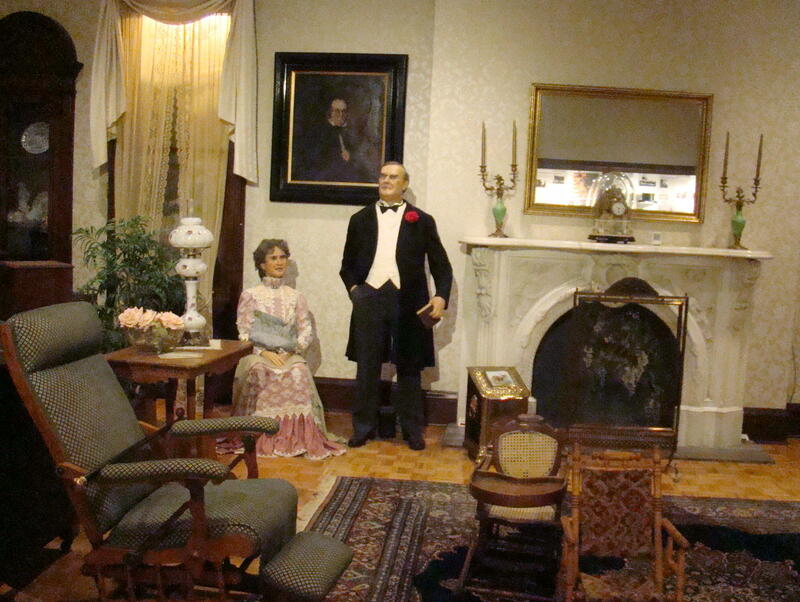 In the Formal Parlor you get a glimpse of a music box purchased on Ida’s trip to Switzerland as well as the piano topped with Victorian sheet music, which she enjoyed playing. 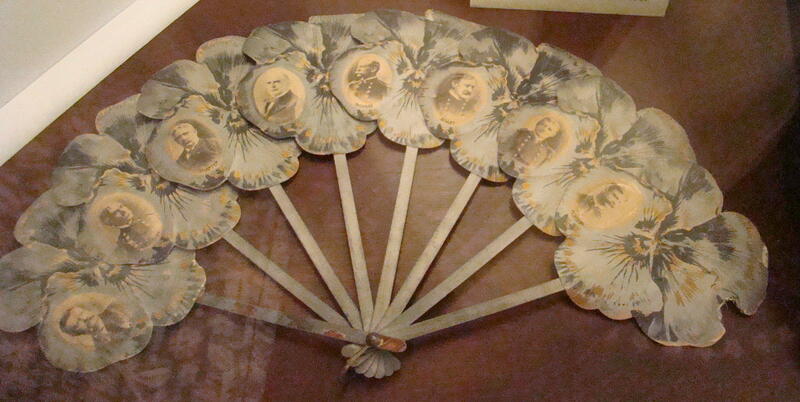 The Library held William McKinley’s chair and a large collection of Ida’s fans, which numbered over 250. On the third floor, William had his office across the hall from Ida’s room so he could be close to her. Their second child, Ida, died at six months of age and two years later Katie, their three year old, contracted typhoid fever and passed away. Consumed by her grief, Ida’s headaches became more severe, accompanied by seizures and tremors. To ease her migraine headaches, her hair was cut because the weight of the braids was considered a possible cause. Medication for her seizures often made her listless. These two problems made it necessary for Ida to sit as much as possible and this petite lady with a 20″ waist, 18″ when corseted, attempted to hide her afflictions as much as possible. If she had an attack out in public, William would put a handkerchief over her face so people would not glimpse her facial contortions during seizures. Also on the third floor was the beautiful ballroom for entertaining. 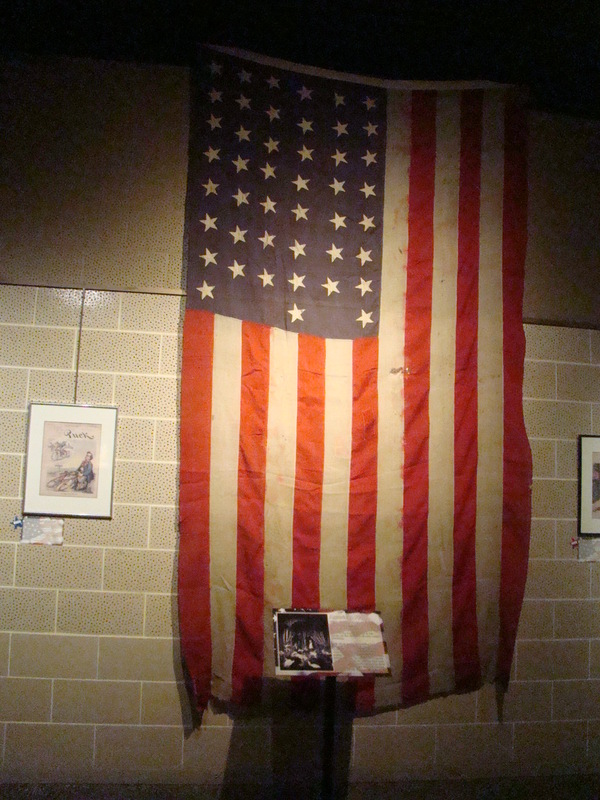 Today the walls of that ballroom display short stories and pictures regarding the life of each First Lady. Many interesting facts were given about various First Ladies, for example, Francis Cleveland happened to be America’s youngest First Lady. Grover Cleveland was a friend of the family’s and actually bought Francis her baby carriage. 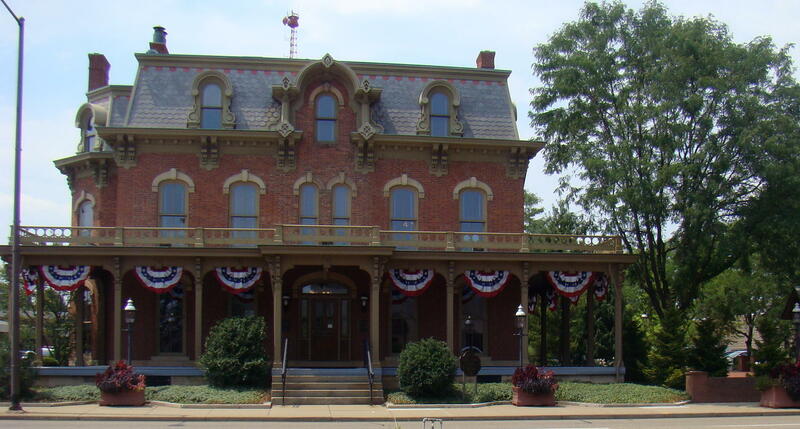 The McKinleys only lived at the Saxton McKinley House for a short time between 1878-1895, while William was serving in the US House of Representatives and then as Governor of Ohio. During his presidential campaign, they moved to a more modest home, which more closely matched William’s background. Often we hear stories about our presidents, so it was refreshing to hear stories about their First Ladies and catch a glimpse at their lifestyle. 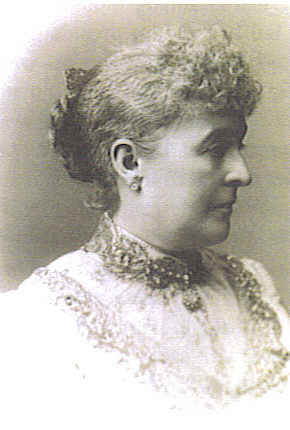 A friend wrote about Ida Saxton McKinley, “Her greatest charm was her perfect sincerity and thoughtfulness for others. No day passed over her head without her doing something for someone.” What a great tribute to this special First Lady! The Saxton McKinley House is located off I-77 in Canton, Ohio right next door to the First Ladies Library at 205 Market Street South. All tours of the facility are guided and admission, which includes both the Library and the House, is $7 for adults, $6 for seniors and $5 for children. First Ladies have always played important roles during their husband’s presidency from hostess at the White House to diplomat. At this time Ohio’s First Ladies are the featured presentation at the National First Ladies’ Library Education and Research Center in downtown Canton, Ohio. The title, From Frontierswoman to Flapper, describes the transition during their life times from colonial living to the beginning of the Jazz Age. 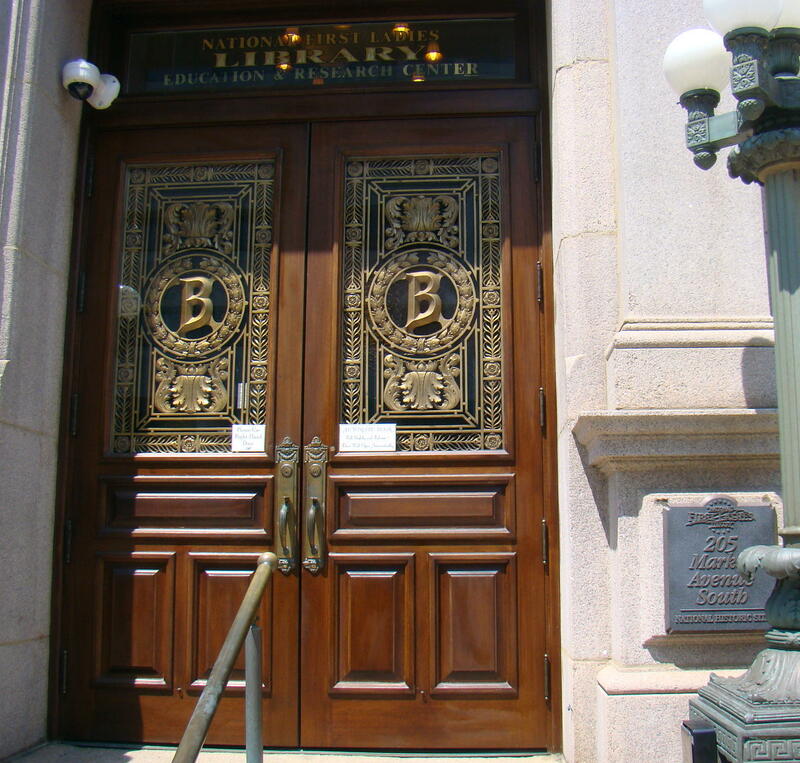 The present day home of the library, an 1895 City National Bank Building, has beautiful original marble floors and walls , thus giving an elegant feeling to the library. The visit began with a video introducing the First Ladies of Ohio. While Ohio lays claim to eight presidents, only seven first ladies called the state home. That still puts Ohio at the top of the list for First Ladies from any one state. Following the video, an excellent tour guide explained the numerous items on display, which led to many interesting stories about the First Ladies and their husbands. Each first lady had her own special interests and talents, making her a unique individual. 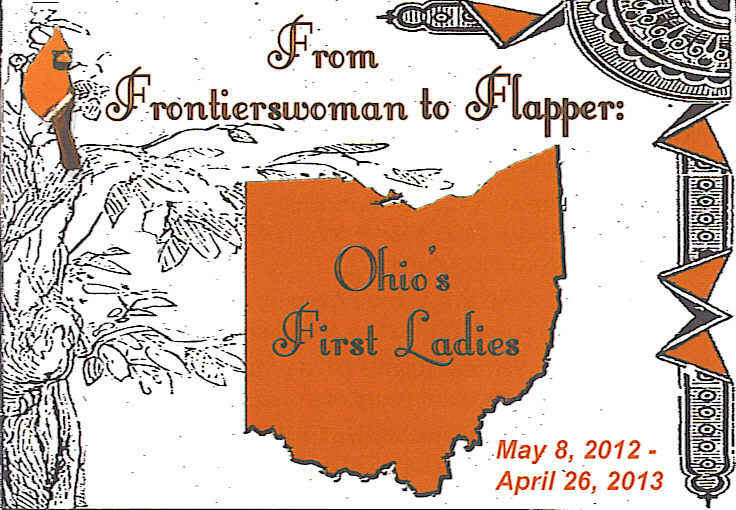 These are a few interesting stories about the Ohio First Ladies that caught my attention during a recent visit. 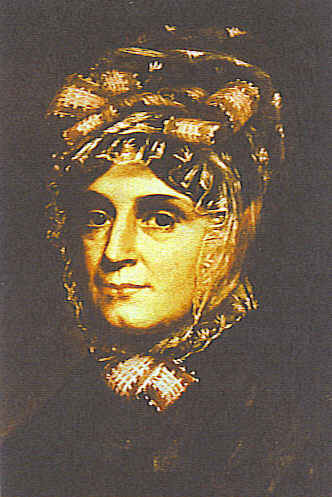 Anna Harrison (1775-1864) first enjoyed being hostess at the Governor’s Mansion where she entertained prominent figures such as Vice President Aaron Burr and Tecumseh. Anna was too ill to travel when her husband went for his presidential inauguration. 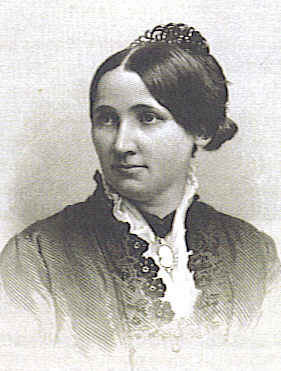 However, one month later, William Henry Harrison died at the White House so Anna never made the journey to Washington D.C.
Lucy Hayes (1831-1889) enjoyed entertaining as she liked being surrounded by people. Her receptions and dinners were always admired, and her china dinner plates each contained a different scene. Lucy was actually the first First Lady with a college diploma. 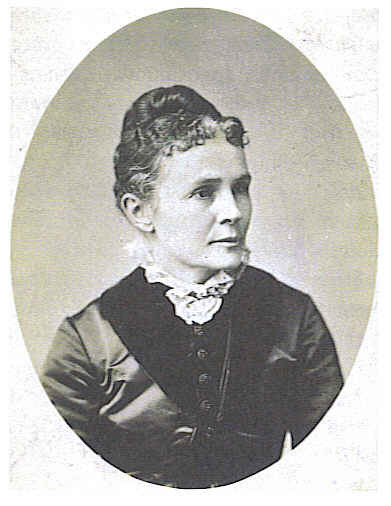 After she spent time with her husband when he was wounded in the Civil War, she traveled to various camps where she visited, and attended to, wounded soldiers. Lucretia Garfield (1832-1918) stayed by her husband after he was shot by an assassin through the eighty days that he wasted away. Perhaps she was one of those early promoters of women’s rights as Garfield needed constant attention from his doctors during this time. The male doctors were paid $10,000 while the female doctor was only paid $5,000. Lucretia was adamant about having that changed so the female doctor also received $10,000. Caroline Harrison (1832-1892) was a star pupil of the German artist, Paul Putzki, and her designs painted on china were on display at the library. Although she was not very well, she enjoyed growing exotic plants and flowers. Her husband never left her side during her bout with tuberculosis and she died in the White House. 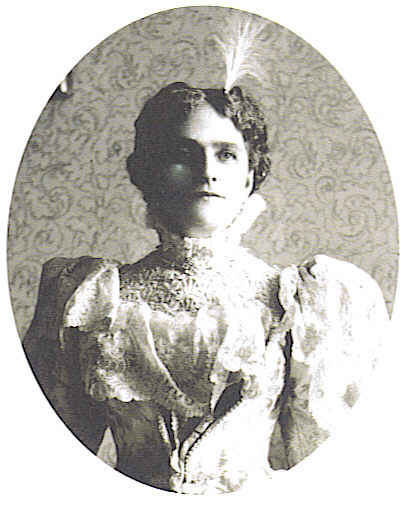 Ida McKinley (1847-1907) suffered from blinding headaches and epileptic seizures after the death of her daughter. Therefore, the only way she could fulfill her role as First Lady was often seated in a chair holding a bouquet of flowers to hide her trembling hands. One of her beautiful garnet gowns with black lace and beading on the collar was featured at the library. When she was able, crocheting was one of her forms of relaxation and many crocheted slippers were given as gifts. 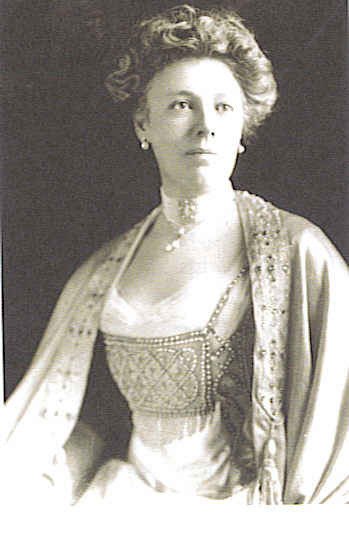 Helen Taft (1861-1943) was the first First Lady to donate her gown to the Smithsonian Institute. One of the most beautiful gowns at the library was Helen’s soft pink dress trimmed with lace and a velvet bow. A beautiful embroidered fan featuring a cherry blossom tree was only one of her collection of fans, but a definite favorite. Because of Helen’s admiration for the Japanese cherry trees, three thousand trees were donated to the United States by the mayor of Tokyo. The Happy Wife is not the woman who marries the best man on earth, But one who is philosophical enough to make the best of what she has got. National First Ladies’ Library has many events for the community and the surrounding area all year long. During the summer they sponsored a Summer Reading Program for K-5 discussing these books this year: First Garden, Miss Lady Bird’s Wildflowers, and Through Georgia’s Eyes. Their Victorian theater shows documentaries on the First Ladies, presents author talks and shares many interesting movies and performances. The First Lady in her Hostess role helps determine how successful her husband’s presidency is going to be. 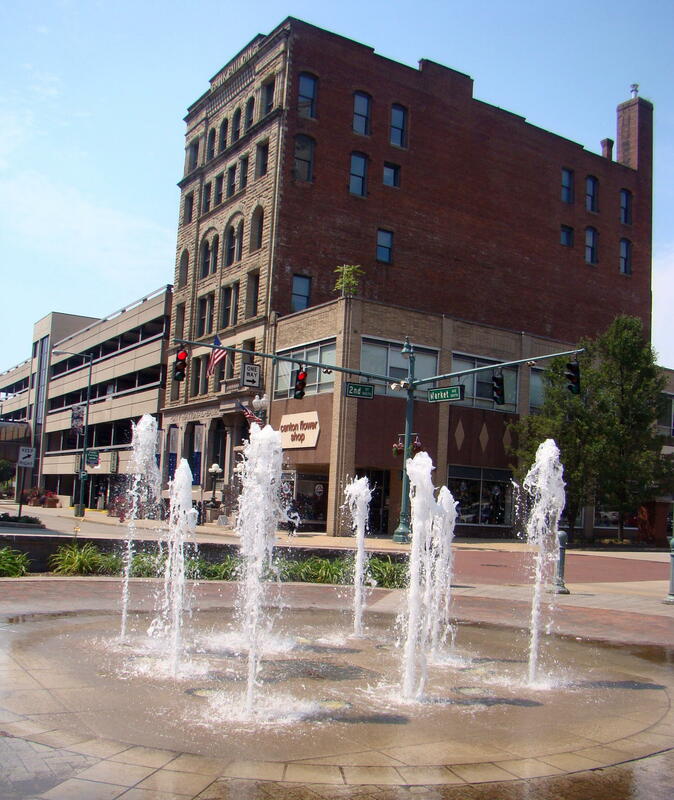 If you would like to learn more about the First Ladies, visit them downtown Canton Ohio. These beautiful doors will open to welcome you! National First Ladies’ Library Education and Research Center is located in downtown Canton, Ohio just off I-77 at 205 Market Street South. All tours of the facility are guided, and price is reasonable at $7 for adults, $6 for seniors, and $5 for children under 18. This admission price also includes entrance into the Ida Saxton McKinley House next door, which we will visit at another time.